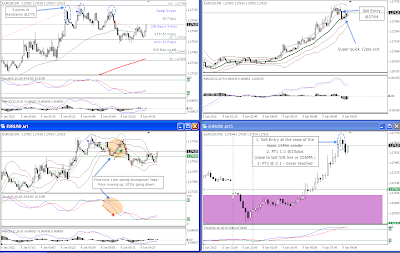 A Forex Trader Mom: Evolution of a trader - spotting stochastics divergence on a chart. Evolution of a trader - spotting stochastics divergence on a chart. He looked at me and furrowed his eyebrows. "You sure you want to trade?" I couldn't agree with him entirely, but I nodded. "I know." I may or may not be getting back my trading groove. I am trying very hard to make this a proper routine. So every day at the same time, I have to park myself in front of my computer. Look at the charts, make notes and plan. Yes, it is supposed to be as boring as that.. I really do like making notes on my charts. It feels like an achievement after I finish working on them. But I do like winning - so "waiting" is something I will have to do. Yes, I am practising my Zen Trader - I will wait for a trade to come to me - mantra. Some points to note, for a very very long time, I have not been able to see divergence on my charts. Seriously. I have been reading at it and trying to look at in the charts. But I really have not been able to see it. You know that feeling.... everybody else seems to be able to see it on the charts, except me. Every time when I sit in on a webinar and they talk about divergence - I don't see it. I plot the indicators on the charts and I still don't see it. I read about it in a book and they have charts on divergence, yet I still can't see it. Well, while working on the charts today, my brain-fog on divergence must have started to clear. I was able to spot a divergence between stochastics and the price. I think it started last night and I used it to enter a short trade which worked nicely. 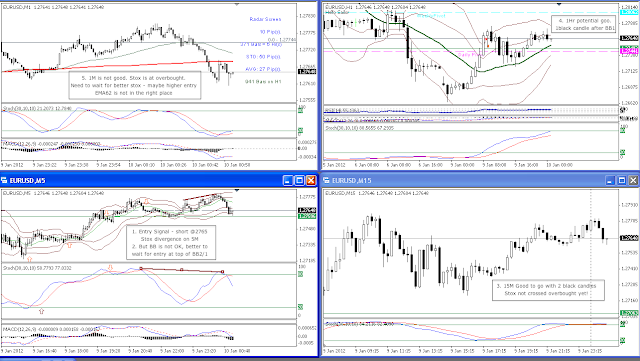 Here's yesterday's trade on 1M charts. I entered short on a typical $EURUSD support/resistance move. In hindsight I may have been over-trading. It was my seventh trade for the day. The day went like this: 1 Loss, 1 Win, 4 Losses, 1 Win. The chart shows the last trade. 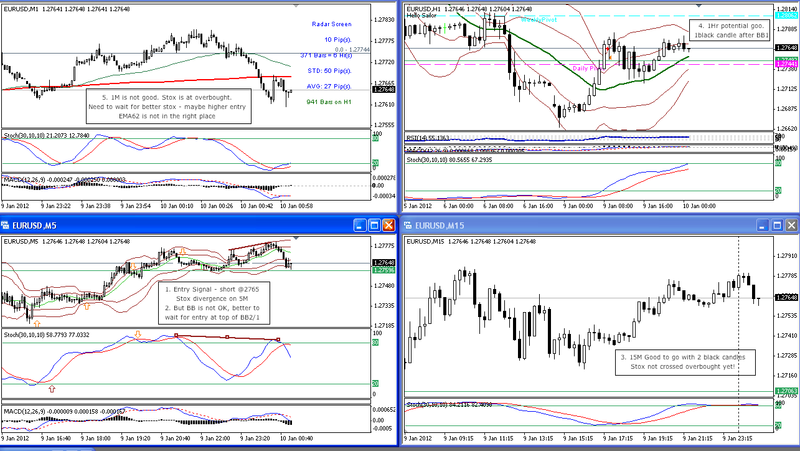 Those quick 12pips brought me back to break-even for the day. It was interesting trade but I did want to exit exit quickly because I was going counter-trend. And I did notice the stochastics divergence - just before I entered the trade. It helped me make a quicker entry decision. Maybe I am evolving - just like this Pokemon - Bulbasaur. Yes, it is amazing the amount of strange knowledge you can pick up while trying to engage a 10 year old boy. Back to trading, maybe in this latest evolution as a trader-to-be, I have been equipped with new powers of observation. Note I didn't say "new powers of trading". Should be fun, let's see where this takes us! Ooops, just noticed that I did not plan for a long entry. I am not sure I want to go long today. I can't see any entry now. 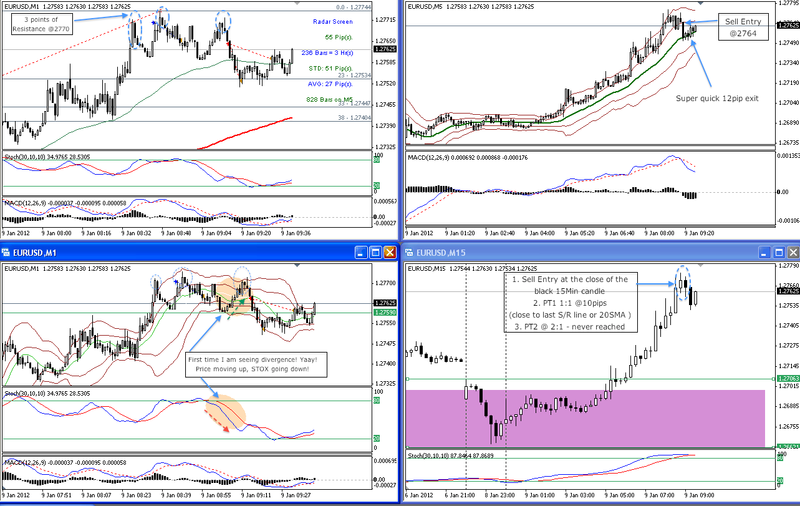 I will go back and have a look at the H1 charts and see if there is are any entries. In the last hour or so $EURUSD has not moved. If the signal for the short entry above does not happen in another hour, which is around 3am or 4 am GMT (or MT4 time). I will most likely not look to enter into any trades until after London session starts.